It's bad news if you'd ever had the notion to follow in Byrson DeChambeau's footsteps and get out a protractor to help you figure out pin locations. 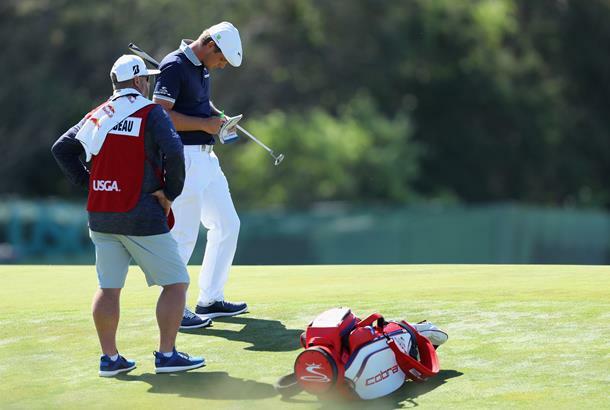 Unsurprisingly, the PGA Tour were initially unsure how to treat Bryson DeChambeau using a drawing compass during the Travelers Championship, as the Rules of Golf do not have any particular rule to outlaw its use. When asked about it, DeChambeau had clarified to reporters in Connecticut that he used the protractor to check pin positions were correct. After first allowing DeChambeau to continue using it, there have since been further discussions and according to a Golf Channel report from Rex Hoggard a statement was sent to players to inform them that using the compass would be a violation of Rule 14-3. "The USGA has ruled that the use of a protractor (also known as a drawing compass) during a stipulated round is a violation of Rule 14-3a of the Rules of Golf," the statement sent to players said. "It is considered ‘unusual equipment that might assist him in making a stroke or in his play." In a further statement released to Golf Channel they clairfied their new position further - ruling out the use of the 'unusual equipment' on account of him admitting its use was to aid him on the course. “With some of these sorts of devices, it can be difficult lines to draw on what’s permissible and what is not permissible,” Bodenhamer said. "But here, we drew the line there with Rule 14-3 [that the compass did not conform].